Caulfield, Timothy and Patricia A. Baird. "Human Genome Project". The Canadian Encyclopedia, 30 May 2018, Historica Canada. https://www.thecanadianencyclopedia.ca/en/article/human-genome-project. Accessed 18 April 2019. 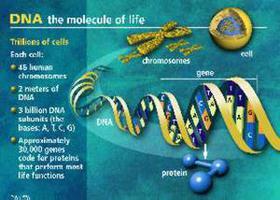 GoalsAlthough the formal goal is to describe the sequence of nucleotides in the total length of DNA in the nucleus of a human cell, genes themselves are in fact very sparsely scattered within the DNA strand. The genome is an organism's complete set of DNA. In the human genome, which is estimated to contain 25 000 genes, DNA is arranged into 24 distinct chromosomes (courtesy U.S. Department of Energy, Genome Management Information System). The Human Genome Project is an international research effort whose goals are to produce a map of the human genome (all the DNA, deoxyribonucleic acid, in human chromosomes) and to determine the location and structure of the estimated 30 000-40 000 human genes. It was launched in a systematic way in 1988 when funding was earmarked by the Department of Energy and the National Institutes of Health in the US for a 15-year, $3 billion effort. 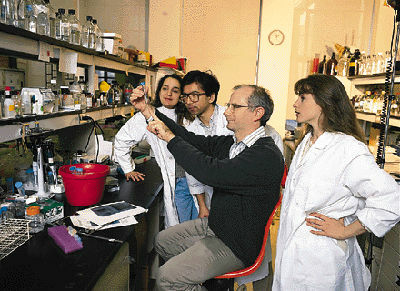 International collaboration by many countries, including Canada, the US, the UK, France, Japan, Germany, Italy and the European Community, has been facilitated by HUGO (Human Genome Organization), an organization that coordinates research strategies, the exchange of data and research techniques, and training. In 2000 and 2001 rough drafts of the Human Genome were published. On 14 April 2003 it was announced that the map was 99% complete, two years ahead of schedule. Now researchers are concentrating on identifying genes and gene function. Although the formal goal is to describe the sequence of nucleotides in the total length of DNA in the nucleus of a human cell, genes themselves are in fact very sparsely scattered within the DNA strand. Some of the DNA helps genes function, but most of it is of unknown function, and much of it may not even be biologically useful ("junk DNA"). Investigation of the sequence of the genomes of other organisms, in particular mice, flies, worms and yeast, is an ongoing part of the project, to provide comparisons to the human sequence. Many genes have been conserved through hundreds of millions of years of evolution, and it is easier to study genes in animal models that are analogous to those in humans. Genes related to particular diseases are being identified at an increasingly rapid pace, and it is clear the project will greatly increase our knowledge of how to identify and manipulate genes. Several thousand diseases are caused by single faulty genes, but each of these is quite rare, so together they account for only a very small percentage of disease in populations. However, researchers hope the project will provide insights not only into single-gene disorders, but also into more frequent, complexly determined diseases, such as cancer and heart disease. In order to tease out the complex relationship between genes and the environment, a number of very large population-based studies have been started, including a project in Iceland that involves the collection and analysis of almost the entire population's DNA. Similarly, in the UK a large project called BioBank will involve the collection of DNA from 500 000 citizens. Individuals possessing certain genes are more likely to become ill with certain diseases because of influences in their environment, eg, diet, lifestyle or chemical exposure. Researchers hope that the identification of such "susceptibility" genes associated with common diseases will allow them to tailor preventive strategies, such as change in diet or lifestyle, so that the genetic susceptibility is never expressed. Identifying people with susceptibilities may lead to better health for those identified, but it may also lead to stigmatization, to lack of access to insured health care in some countries, and to the creation of a class of individuals who are anxious about their health. Focus on genetic determinants of disease also diverts attention from social and environmental causes which may be equally or more important, as in the connection between smoking and lung cancer. Genes give instructions to make many molecules, such as hormones, that are essential to body functions. Biotechnology companies hope to use the understanding of this process to make therapeutic molecules for the treatment of common diseases. As a result of the tremendous scientific advances that have occurred in areas such as genetics, biotechnology has emerged as one of the fastest growing sectors of many countries' economy. However, there is concern that if dissemination and exploitation of knowledge from the Human Genome Project is left largely to commercial firms, there will be less likelihood of wide benefits, as such a course is likely to lead to inequitable access (not all people will have the ability to pay). In addition, strong marketing would make premature and inappropriate use more probable and may add unnecessary costs to the health care system. Many ethical dilemmas are raised by the fact that gene identification will be possible in most cases well before any useful therapy is available. The ability to identify aspects of an individual's genome also raises important questions of privacy, confidentiality and autonomy. What rights, if any, do others (relatives, employers, insurers) have to such genetic information? Will a distinction be made between using genetic technologies for therapeutic purposes and using them to enhance an individual's characteristics? Will the way we view ourselves, and how we define normality/abnormality, change? Because of these and other questions, the study of the legal, ethical and social issues remains an important part of the overall research agenda in most countries involved with the Human Genome Project. E. Pennisi, "Reaching Their Goal Early" 300 Science 409 (2003) and "A History of the Human Genome Project") 291 Science (2001); W. Bodmer and W. McKie, The Book of Man. The Human Genome Project and the Quest to Discover our Genetic Heritage (1995); J.D. Watson, "The Human Genome Project: Past, Present and Future," Science (1990); N. Wexler, "Clairvoyance and Caution: Repercussions from the Human Genome Project," in eds, D.J. Kevles and L. Hood, The Code of Codes (1992). Genome CanadaLearn about the science and applications of human genome research in this Genome Canada website.